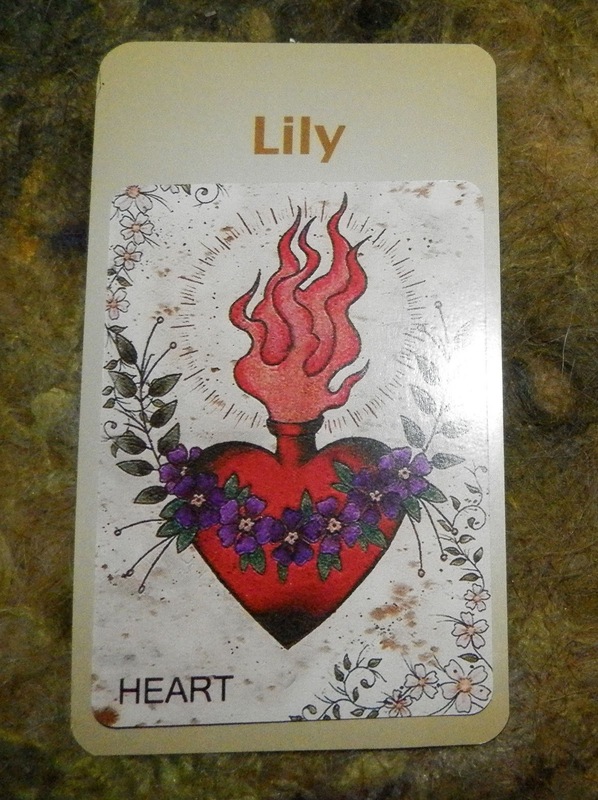 Today's Draw: Heart from Paris DeBono's Gypsy Tattoo Oracle in the House of Lily from the Deck of Lenormand Houses. Are you a raging hormonal lunatic? Has menopause driven you to the brink? And are you feeling bad about it? The Gypsy Tattoo Oracle isn't a Lenormand deck, but I just received it today and decided to use it like one. The Heart card is about love and emotions. 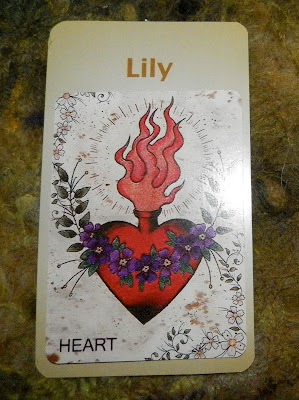 And the House of Lily is about wisdom and maturity, sensuality and serenity. So I could go a couple of ways...I could talk about sensual love relationships. Or I could talk about "maturing emotions" aka my raging menopausal hormones. Unfortunately you're going to hear about the latter. You know, for all you men and younger ladies out there, I'll tell you this—you cannot possibly fathom the insane and dramatic mood shifts that can happen during menopause until you actually experience them. Most women (and men) know about PMS. PMS is child's play compared to the more "mature" experience of menopausal hormonal rage. Not following my own advice from yesterday, I got too bogged down in the details of something—trying to control the uncontrollable—and went off on a customer service person over the phone. F-bomb action. Screaming action. I'm sure anyone within a square block radius heard me. I have a voice that carries. God bless her soul, it was so insane and out of proportion that the customer service rep was trying hard not to laugh. This isn't the first time, either. It's happened a few times in the past couple of years. The first time took me by surprise. It was fueled by paranoia and, even while I accusing the other person of stuff, there was a sane person inside my head asking "why are you doing this? You don't believe this." But I couldn't stop myself. I really felt like I was loosing my mind. See, I don't want to take bio-identical hormones and pharmaceuticals. It just doesn't feel right to me. It feels like what Monsanto does to corn. So I'm looking into more natural things. And, mostly, I'm just hoping to wait it out. In a year or two this whole menopause thing will be done with. Maybe even in less than a year if my ovaries play their cards right. And I'll settle into a new normal that I can deal with. But in the meantime, I've had maybe three big incidents in two years and one of them was today. And I hate being that person! Why am I sharing this with you? Because back in our mother's time, we were told we were imagining things. Even now, this is something we don't talk about. It's a "secret shame" we hold...because we "lost it" on someone. And it's scary when it happens. We can talk some about night sweats and insomnia and memory lapses and some of the other symptoms, but when it comes to emotional meltdowns, who likes to admit to THAT? Women were sent to sanitoriums over stuff like THAT. And if you have a male doctor, like I do, really how much can he understand? I've almost always had male doctors, so I'm not being sexist. I'd say the same about a female doctor in her 30s, quite frankly. You only have observation at that point. You have NO IDEA of what it feels like to have one of these meltdowns inside and how out of control you feel. It's like a violence within. And it's scary that you can turn on a dime like that. Until you experience it yourself, it sounds like someone's being dramatic. And while I'll cop to being dramatic, I'm not being dramatic about this. So anyway, I wanted to share for all the other women out there going through this or about to go through or who have made it to the other side. We've been given this miracle process in our bodies that allows us to have children and connects us to the human lifecycle in amazing ways. And when it starts breaking down, it takes a toll—physically, emotionally and mentally. It's an honor and a curse to be a woman. And the things we experience because of it are real. It's not a reflection on you when you go balls-to-the-wall crazy on someone...haha. It's the way we were built and part of our path. And we—I—just have to remember to be easy on and kind to ourselves until this process is through. Amen, Sister! I just started riding the emotional rollercoaster last year. My nerves tense up so bad for days and then it all goes away in an instant. It is like a rollercoaster. It is a great feeling to be on the downer end of things. I don't get verbally nutso, but I tell my Hubby what's going on and he steers clear and watches me from the corner of his eye. I sometimes think he sleeps with one eye open when I'm on this jag for fear of me doing crazy things to him in his sleep. However, I take bioidentical hormones, which are a blessing. It calms these jags and eliminated night sweats. This stuff is made from plants and mixed in the drugstore. I will not do without! I understand! Choose your own path with this, but at least get some advice from a naturopath or some other knowledgeable person. I hope this IS your last year for you. I hope it doesn't even last that long! If the meditation and energy medicine helps, please let me know. I am all for trying anything to not have to take medication. Oh. Did I mention the menopausal acne? It's horrible! Zits pop up here and there and take their good ol' time going away. I'm talking weeks. Not much helps. A good teenage scrub/cleanser and toner helps. Good luck and PLEASE let me know. E-mail me if the energy medicine work.